Oh my! Oh me oh my....! Can I get a high five? I opened registration for the 2018 Maine Stitching Retreats on Monday, and within three hours Slow Stitching sold out... Holy Cow! That happened so fast my head is still spinning... I guess that's what happens when you give folks time to think things over. To everyone who signed up on March 5th, thank you! I look forward to meeting the new folks and seeing some old friends again in August! For those who got shut out, I am very very sorry! Lest anyone think all the spots were taken by returning participants, that was not the case. Some past attendees were hot on the task, but others lingered, and so many new people will be coming to Maine with us this year! I do not want to belabor this situation, but just to say thank you for the enthusiastic response to this retreat....! While Slow Stitching is full, there is still room for more stitchers at both Slow Fashion and Wardrobe Basics with Lauren Taylor! I would love to have you join us for either of those retreats. Slow Fashion with Cal Patch, Katrina Rodabaugh, and Jessica Lewis Stevens takes the same format as Slow Stitching but the subject matter is garments instead of quilts. 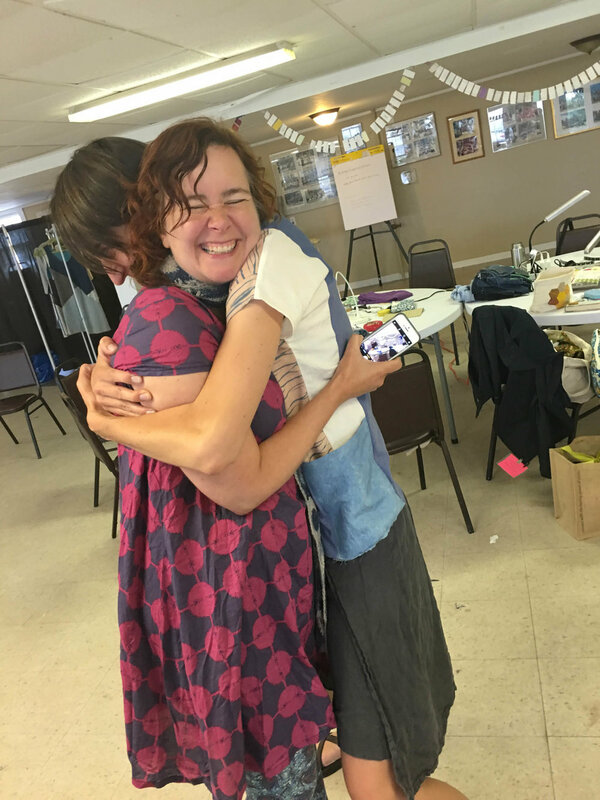 If you are nervous about your garment sewing skills, rest assured this week is very laid back and accessible, even to those with basic sewing skills! Cal teaches pattern drafting in a very patient and encouraging manner, and will have you on the road to designing your own tunic in no time! You can read her blogpost about last year's retreat here. Katrina will teach you a number of ways to prolong the life of your current clothing through thoughtful, and beautiful, visible mending. Jessica surrounds us with expansive color in her natural dye pots, showing you how easy it really is to work with plants and natural materials to dye cloth. The whole week is quite magical, being right on the beach in Southern Maine... If it is at all intriguing, I hope you'll join us! If you are committed to making your own clothing, then the long weekend with Lauren Taylor, AKA LLADYBIRD, will change your game! Lauren is completely self-taught and entirely hand made at this point, and in this weekend we'll be sharing skills to put you on that road. If that's what you'd like...! This is a workshop for those who have been sewing clothing for a bit, and are ready to step up their skills, and fill out their closet. 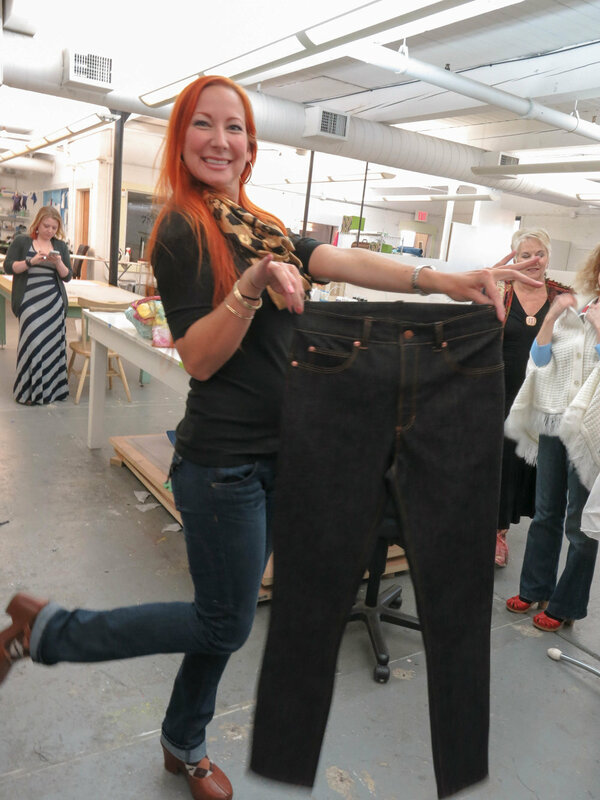 Lauren is bringing a full set of Ginger jeans muslins in sizes 0-20 for you to try on. And I will have a number of shirts and/or dresses made up in various substrates to get you comfortable with matching fabrics to patterns. It's going to be a very useful workshop for the garment minded among you! Do be aware that this workshop is limited to ten participants, and we are already up to eight. So just two spots left in this weekend...! As I write this I am sitting by the window watching another snow storm blanket my landscape with white. March in Maine is never the Spring that it is further South and West. To me, it is the longest month. The days are starting to be recognizably longer, but the temperatures are still chilly. And then we can still get snow, sometimes all the way till April. Sigh. BUT! Spring will come, and after it Summer, and then I will see some of you here in the beautiful lush green that is Summer in Maine. And we will stitch all the beautiful things, and we will laugh, and we will slow down, and absorb the joy that is making with our own two hands. Until then, Stitch More Buy Less!